Normally I would haul our own composted mulch from the city lot. This year I just can't handle the lifting. The soil in my beds is rich and weed-free after two summers of deep mulching, so I thought I'd spring for some pine straw. It comes in compressed bales, like hay, only much, much lighter. This means I can do almost all the landscaping without help. If you go to Georgia, you'll often see huge spans of lawn covered with pine straw instead of grass. That's the tactic I'm trying underneath the giant magnolia, where nothing--short of $500 worth of groundcover--will thrive. The straw does settle and bleach over time, but after a hearty application like this one, can simply be top dressed for the next season. Hopefully we'll have sold the house by then! The straw looks really nice. We use redwood chips in the shady areas around my house. It just gives it a nice finished look. Wow! 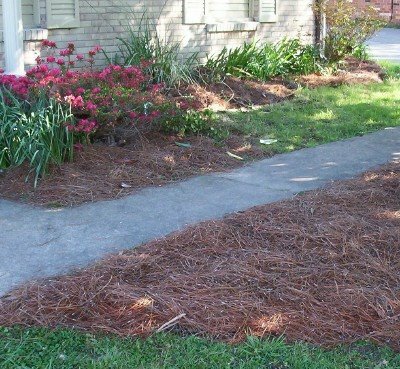 We live in a very different zone than you, but the pine needle drop (2x year) is a major headache around here. Required by law to bag our yard waste for pickup in specific paper bags that must be bought! Pine is VERY acidic, and I often wondered if I could just mulch my garden with the dropped needles, but worried about what it would do to the soil. I once tried mulching under the swingset with the old needles, but they get really slippery when wet, that was a mess. I will top dress my beds with needles this spring, see if it affects the flowers too much. Blueberries love acid and also cold winters, maybe will plant some blueberries. As you can see this yard has a lot of azaleas which love the acid anyway! I live in Georgia and love pine straw as ground cover, but hate the fact that it fades so quickly. I found a topical colorant at Pike Nursery in the Atlanta area and I am hooked. Like you said, the azaleas live the pine straw and I love the great color provided by this EnviroColor.